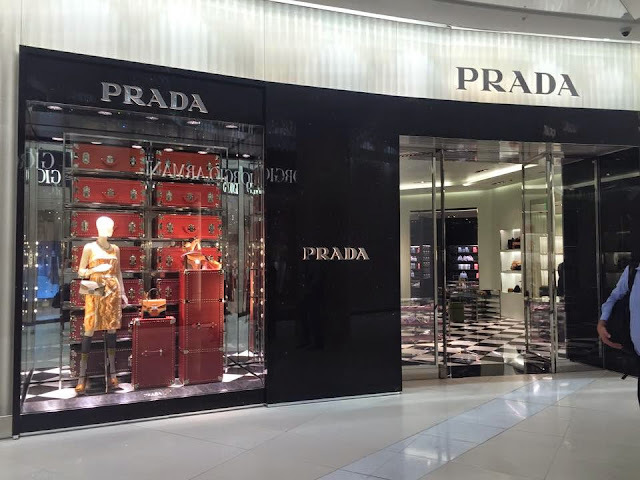 Prada opens its first store in Johannesburg, South Africa, inside the prestigious Sandton City Mall shopping centre. The space, designed by architect Roberto Baciocchi, covers a total surface area of 800 square metres and houses the women’s and men’s ready-to-wear, leather goods, accessories and footwear collections. The internal façade, of remarkable visual impact, stretches approximately 65 metres in length and with its elegant geometry results the focus of the “Diamond Walk”: a backlit white canvas curtain enclosed in a crystal box creates a sophisticated atmosphere. Black marble frames border the entrances, windows and light boxes, lending a precious flair to the space. The entrance to the area dedicated to the women’s collection opens on a large octagonal space characterised by the signature black-and-white marble chequered flooring – a legacy of Prada’s identity worldwide – and green fabric-clad walls, which serve as a backdrop for sleek polished steel display cases embellished with black Marquinia marble chests of drawers. From here, the visitor is led to two spaces defined by black marble-clad walls with cut-in alcoves dedicated to the display of exquisite leather goods, accessories and bijoux. The areas devoted to the women’s ready-to-wear and footwear collections are separated by a green fabric curtain; elegant transparent perspex display units showcase the women’s ready- to-wear collections. The space housing women’s footwear is characterised by crystal and polished steel display niches, beige carpeting, fine crystal tables and green velvet sofas, to welcome customers in an elegant and refined atmosphere. The area offering the men’s collection features masculine materials and finishes: slim Saint-Laurent marble floorboards and walls featuring bright orange encaustic painting. The first room is dedicated to the leather goods and accessories collections: precious polished steel display cases exalt the product. A mirror portal leads to the spaces where the men’s ready-to-wear and footwear collections are displayed: polished steel counters with coloured saffiano leather elements and green ostrich leather sofas complete the setting.